Hole 13 is an easier par 4 and a potential birdie hole for the pros as many are left with approach shots under 100 yards. In the final round of the 1972 U.S. Open, defending champion Lee Trevino pitched to within a few feet of the flagstick for a birdie. Trevino tied for fourth that year, won by Jack Nicklaus. The shot on World Golf Tour is only from 40 yards, but it's from the rough to a green that's sloped severely from right-to-left back toward the ocean. WGT Hole 13 Tip - Aim right and use extra power to get out of the rough. 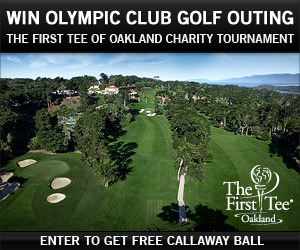 Play the First Tee of Oakland Charity Tournament on World Golf Tour for a chance to win a golf outing at The Olympic Club. 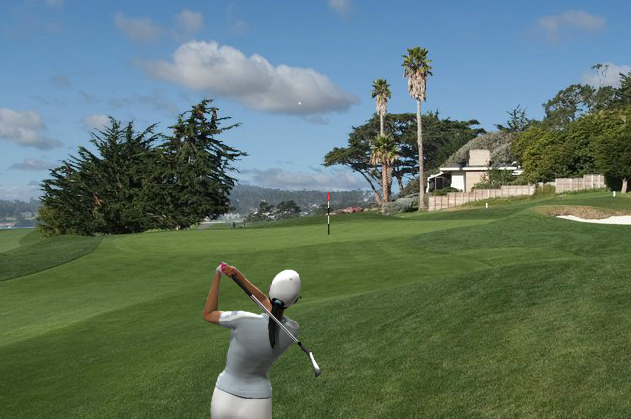 This special online golf tournament costs 500 WGT Credits to enter, with proceeds going to benefit children in the First Tee golf charity in Oakland, CA, which promotes youth development and life skills through golf. 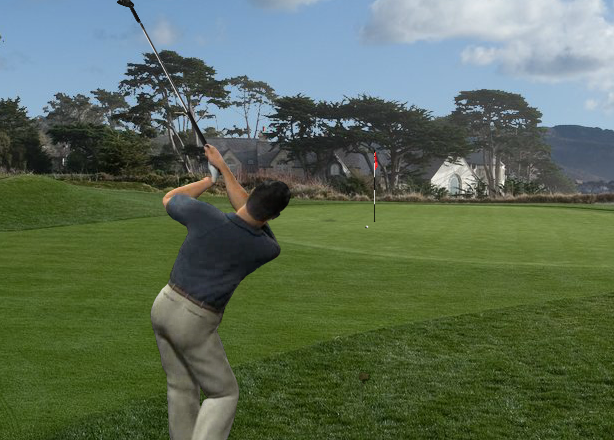 Every player who enters gets a free Callaway Tour i(z) virtual golf ball, and one lucky sweepstakes winner will win golf for four people at The Olympic Club in San Francisco, host of the 2012 U.S. Open. All entries receive 1 free Callaway Tour i(z) virtual golf ball (Level 35). One entry will be randomly selected to win the grand prize golf outing for 4 people at The Olympic Club in San Francisco, travel expenses not included. See tournament rules for details and eligibility. 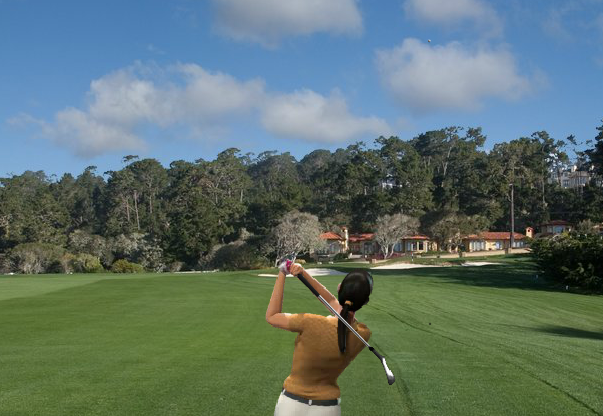 Hole 11 is one of the harder par 4 holes at Pebble Beach. The drive is a relatively easy, but the small green is raised and surrounded by bunkers, making for a difficult approach shot. In the first round of the 2000 U.S. Open, Nick Faldo hit this 129-yard approach shot within a few feet of the hole for birdie, and went on to finish in 7th place that year. Faldo won six majors in his career, but never the U.S. Open. You can try the same approach shot on World Golf Tour from 129 yards in the fairway to the challenging green. WGT Hole 11 Tip - Use a higher-lofted club and adjust your power carefully to get this shot close. 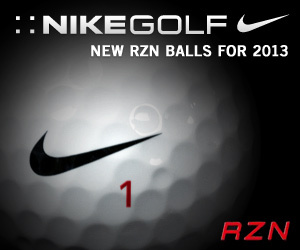 Nike Golf has upgraded their 20XI golf balls for 2013 with a new RZN core, now available now for top players on World Golf Tour. It doesn't get easier on the Back 9 at Pebble Beach. Hole 10 is a long par-4 right along the ocean. Many players end up short of the green and chipping their third shot. Mark O'Meara is no stranger to Pebble Beach, winning five AT&T National Pro-Ams here. But at the 2000 U.S. Open, O'Meara holed his 22-yard approach shot for a magical birdie on Hole 10. On World Golf Tour, you can try O'Meara's approach chip yourself. See if you can get this little chip-and-run to drop in the hole. WGT Hole 10 Tip - Aim left, as the green breaks left-to-right back toward the ocean. You can now get real-world golf gear in the WGT Pro Shop Elite Collection. 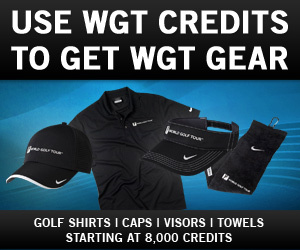 Use your WGT Credits to get new golf merchandise from Nike Golf that features the World Golf Tour logo so you look your best out on the real course. These high quality and high performance golf shirts, caps, visors and towels start at 8,000 WGT Credits. *New items from Nike Golf are real world items, cost includes processing and shipping worldwide. Hole 7 at Pebble Beach is one of the most memorable in all of golf. You're on a cliff, surrounded on three sides by the Pacific Ocean crashing on the rocks below. You face a short downhill shot to a green that seems to get smaller as you stand on the tee. There have been many well known shots here. Back in 1982, Tom Watson stuck his tee shot to just 2 feet on Sunday, putting him five under par on his way to the U.S. Open Championship. 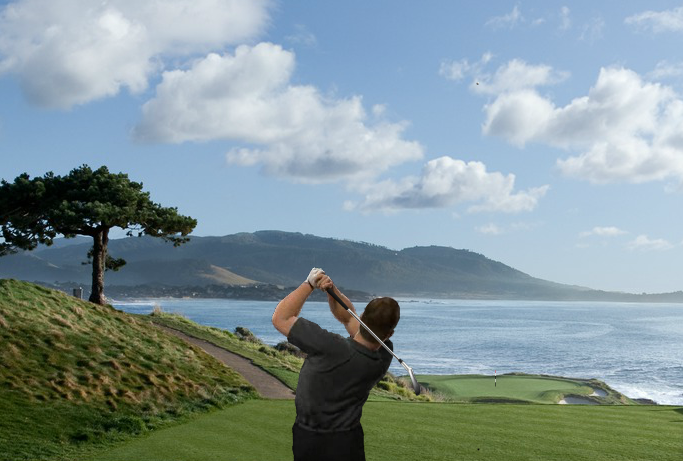 On World Golf Tour, you'll be on that same tee virtually, facing one of the best shots in golf. WGT Hole 7 Tip - You'll need to use a little less power on your shot, as the hole is 28 feet below you. Take a virtual trip to Hawaii and play this month's featured course in the Manele Challenge tournament on World Golf Tour. This free closest-to-the-hole online golf tournament has amazing Pacific Ocean views on "The Challenge at Manele" golf course on Lanai in Hawaii. The course is designed by Jack Nicklaus and is one of the latest on WGT. *This tournament runs now thru 2/28/13, see rules for details and eligibility. Challenge your skills on the new Best Of Par 3 course on World Golf Tour. This new full stroke play course features a mash-up of some of the best par 3 holes from your favorite WGT golf courses, including Congressional, Kiawah, St Andrews and others. 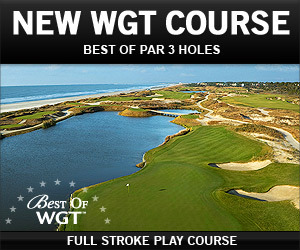 Just select the new course in the WGT game menu. Because the Best Of Par 3 course is a par 27 course, scores are not ranked, so it's not available in ranked stroke play format. However, you can play practice stroke play games, or against other players in match play, skins or alternate shot games.